Campbell River had, since the 1940s, received much of its water supply through the generating station. When BC Hydro embarked on construction of a new underground hydroelectric generation facility, it resulted in an ambitious project to give the city an independent means for sourcing its drinking water. The Campbell River Water Supply Upgrade required an $18.3­ million investment from BC Hydro and $10 million from the City to construct and operate an independent water delivery system and build a new water treatment facility and pump. The design provides better efficiencies to reduce costs, and also reduces impact on the surrounding Elk Falls Provincial Park by combining operations at one location and eliminating a section of transmission line through the park. The first phase of the project involved open-cut installation of 1.2 kilometres of connecting pipe, while Phase 2 required 1.4 km of connecting lines along with the lake intake structure, pump station and water treatment facility. A key portion of Phase 2 focused on the raw water intake, which called for a new 1,524-millimetre (60-inch) microtunneled pipeline connecting a caisson adjacent to John Hart Lake to a submerged intake screening system at 14-metre depths. The intake tunnel comprises 116 m (380 linear feet) of 1,556-mm ID Permalok microtunnel section joined to the intake screening system with a submerged 147­-m, 1,600-­mm fused joint HDPE pipeline. Aecon Infrastructure­-Frontier­Kemper Constructors JV was awarded the contract for this segment of work on May 10, 2016, with Frontier-Kemper (F/K) performing the microtunneling work. The microtunneling system, ancillary equipment and pipe was moved to Vancouver Island on the City of Vancouver's car carrier barge. Frontier-Kemper crew mobilized to Vancouver Island in early September. "The location of the MTBM installation and slurry plant was adjacent to the lake and the jobsite surroundings were impeccable with an abundance of wildlife," remarked F/K MTBM operator Mike Abbott. "The natural beauty of the site location made the job that much more enjoyable for the crew." The lakeside geologic conditions for the microtunnel installation involved clays and sands, with sand primarily present near the lake. Microtunneling is an ideal means of accurate pipe jacking in low blow count and flowing soil because its closed slurry system offers continuous support to the MTBM face to balance groundwater and soil pressure during excavation. It's also the safest choice in high water levels, since the MTBM is remotely controlled by an operator in the control container at the surface level. Frontier-Kemper used an Akkerman SL60C MTBM system with a mixed ground cutter head to contend with the mixed-face geology. The system includes an MT875K jacking frame with 800 tons of thrust capacity, a control container with the operator control console, power distribution centre and MTBM drive motor, a series of pumps to assist with excavation and slurry circulation and a Derrick slurry separation plant. A 9-m­-diameter, 15.2-m­-deep caisson intake structure built for the pump station served as the microtunneling jacking shaft and was modified with a shaft seal to prevent lake water and ground intrusion, a concrete reaction block to bear jacking thrust loads and scaffolding stairs for crew access. Microtunneling on projects with high volumes of ground water offers unique challenges and requires a delicate balance of expertise, operator skill and risk mitigation. F/K project manager Nestor Garavelli explained, "F/K viewed the interface with the lake and the disconnection of the MTBM from the jacked pipe as the two points of high risk on the project. We employed Fraser Burrard Diving Limited to survey the interface and remove any foreign material that may create an obstacle for the MTBM." F/K was concerned with the shallow cover and flowable material present at the lake interface. "The pipe would be subject to uplift when disconnected from the MTBM, thus making the connection with the remaining pipeline an issue," Garavelli stated. To counter this upon MTBM breakthrough, he explained, "the diving crew would add concrete blocks with straps to weigh down the section of pipe behind the MTBM to prevent pipe flotation. A grouting campaign through the pipe would also be undertaken to ensure that no cavity existed between the pipe and the excavated ground surface." To prevent the tunnel and shaft from flooding, Garavelli said, "a double bulkhead was built into the end pipe section closest to the MTBM. The in­-pipe bulkhead was welded in place at 1.2 m in the first pipe joint. Next, small hydraulic jacks were installed between the end of the MTBM and the bulkhead of the last pipe section, which were controlled from the shaft side within the pipe, to allow for the release of the MTBM from the pipe section." Preservation of the ecological integrity of the lake, which not only provides drinking water for city residents but also feeds prime salmon habitat in Campbell River, was key. A floating debris boom was installed in John Hart Lake to inhibit potential contaminants during construction. The SL60C MTBM was launched on September 6, 2016. The first seven 1,594-­mm­ OD Permalok pipe joints were fully welded to prevent joint separation from the weight of the MTBM when it emerged into the lake bed and subsequent buoyant force when the MTBM was removed. Between each 3-­m pipe set, a pipe clamp helped to counter the average 18 psi static groundwater pressure and hold the most recently installed pipe in place while the next pipe set was lowered and welded. Along the 116­-m alignment, the MTBM encountered soil variances from soft silts to glacial till seams. Frontier Kemper's seasoned operator navigated the MTBM through the changeable ground. It's common to find tree stumps in man-made reservoirs, and an extra­-large specimen was discovered on the lake bed in the alignment path. While microtunneling was underway, Fraser Burrard's dive crew used underwater chainsaws to dislodge a large stump and massive root system lying in the path of the MTBM's entrance into the lake. On September 21, with the obstruction removed, the MTBM had a clear path to emerge into the lake at 14­-m depths on line and grade. Afterward, F/K entered the tunnel from the caisson side to disconnect the microtun­neling utility lines and install the MTBM's bulkhead cover. Next, crew retracted utility lines from the first pipe section, closed the bulkhead hatch door and pressurized the chamber between the MTBM and pipe bulkhead. "Prior to releasing the MTBM from the pipe, a pressure test was conducted on the bulkhead to ensure that no leaks were present and the hydraulic jacks were also given a test run to ensure that there were no failures," Abbott described. The MTBM was successfully released and retrieved from the lake surface without any water breaching the bulkhead. Fraser Burrard's team retrieved the MTBM from the lake on September 30. 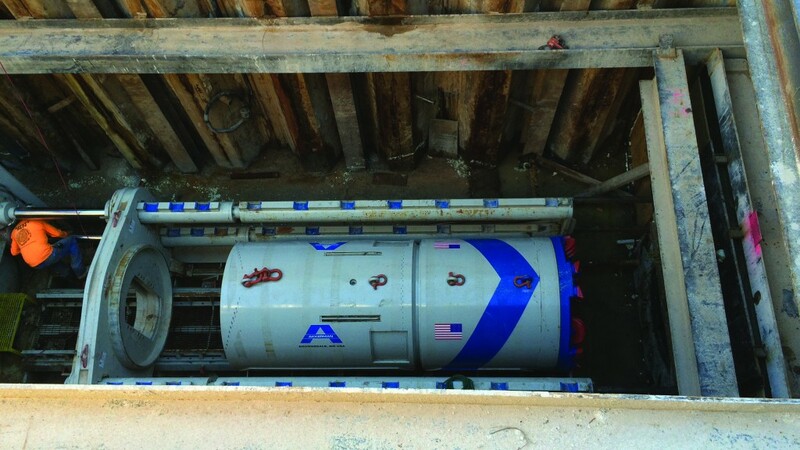 Aecon Infrastructure completed the intake connection with a 147-­m fused­-joint 1,600-mm HDPE pipeline which was floated and submerged into the lake and attached to the microtunnel, angled downward toward the intake screen. "The project was deemed a big success for Frontier-Kemper and the project team," Garavelli con­cluded. "This was the first lake tap that Frontier-Kemper had undertaken, and the crew's knowledge and teamwork were instrumental in the success. The support of the owner and engineer along with AECON formed the perfect team to allow for a very important piece of infrastructure for the Campbell River community to be completed on time and on budget." The City of Campbell River put its new water supply facility into operation in June of 2018, on time and on budget. "The direct, deep-water intake and consolidation of water treatment under one roof provides water in an efficient and safe manner and will serve the residents of Campbell River for many decades to come," said Campbell River Mayor Andy Adams. Laura Anderson is Marketing & Communications Director with Akkerman. This article was originally published in the NASTT publication Y-Dig, and is reused with permission.